Life’s A Ball (Mason Jar)! 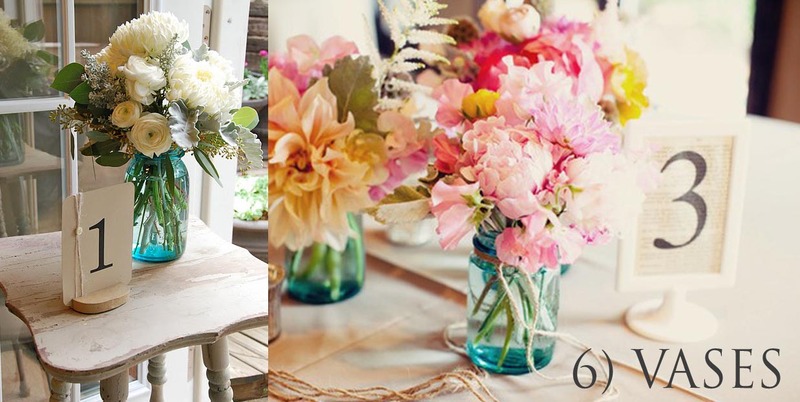 We can’t help but notice the resurgence of the mason jar on the wedding scene. These beauties have made their way out of grandma’s basement and into centerpieces and wedding schemes across the board! Maybe mason jars have gotten a bad rap in the past for their association with (uh-hmm) moonshine, but everyone has looked beyond that now and truly embraces this Southern staple. Not too long ago the amount of food a family had in mason jars at the end of the summer determined exactly how much they would be eating that winter. So truly, these glass jars are responsible for keeping many people alive (and in some cases we will admit – tipsy) for years. The very nature of the mason jar makes it useful in so many ways. Because it is solid glass it does not leak and can tolerate high temperatures. Its smaller size makes it lightweight enough to hang while still being sturdy. They can be lidded or the grips where the lid would go on the jar can be helpful in affixing ribbons or strings that won’t slip. And best of all they are inexpensive (except for some rare ones) and very easy to find. In fact, the jars have become so popular that most rental companies will now rent you mason jars for your events. We love when we can recycle something and repurpose it in many ways. Here are nine clever ways to incorporate mason jars into your wedding. Make an impression with your guests from the start by using invitations with a mason jar motif. We love that these cream colored invites with the blue mason jars give you the option of ordering them with or without the fireflies! The scalloped edge reply card/postcard that matches the large blue mason jar invite is just perfection. For centerpieces that stand alone you could use these etched mason jars that look like they have been frosted and inscribe an initial or table number. 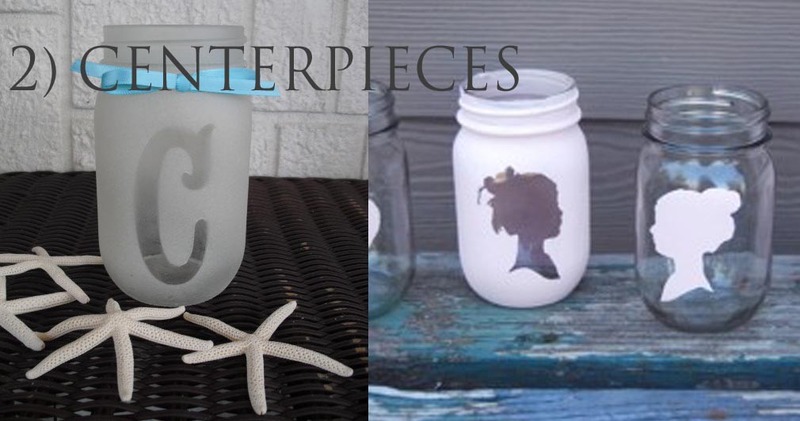 These dainty painted silhouette jars would look great alone or filled. While the mason jar chandelier might be going overboard, we had to include it thinking that it would be more than amazing if it was a part of your venue. This mason jar lamp on the other hand is actually pretty simple and the directions are online. 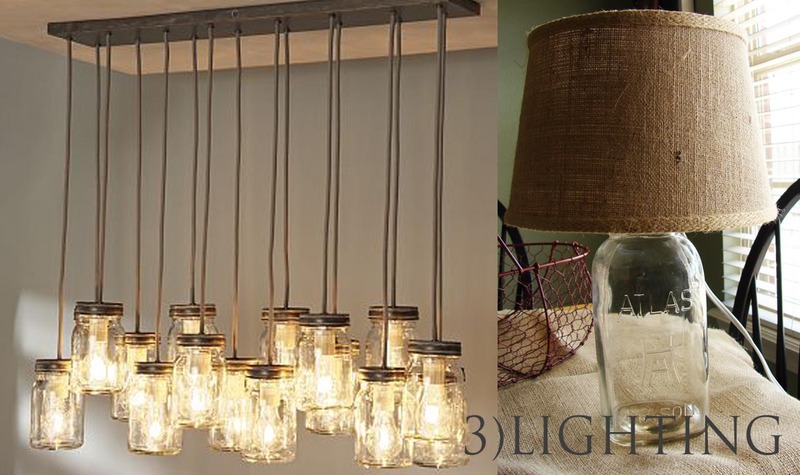 Placing a mason jar lamp on each bar corner would make quite an impression. Serving a signature cocktail in a mason jar just makes sense. It is the one piece of glassware your guests would hold and really examine up close. You can use small jelly jars or a large jar that will provide more room for garnishes. 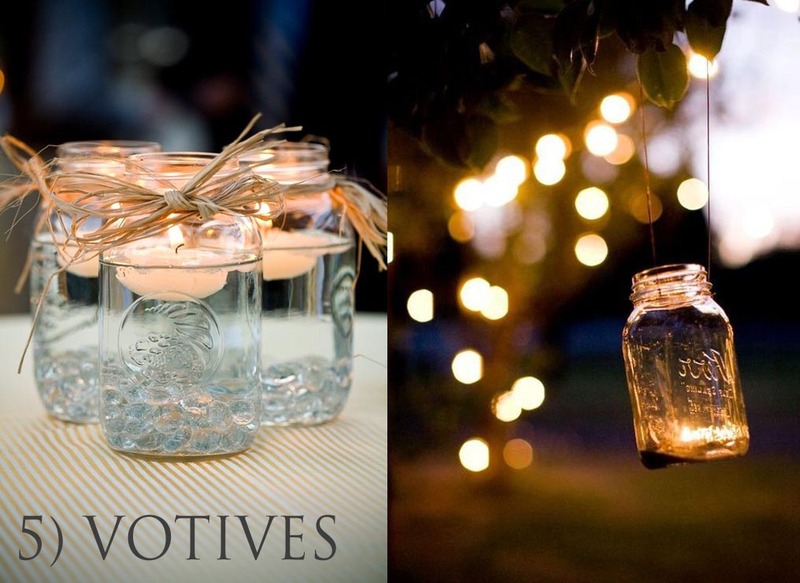 Mason jar votives are simple and look great at night. You can use them for a floating votive or a regular votive with filler in the bottom. We also love the idea of hanging the jars and adding a votive as well. One of our favorite uses for the mason jar is as a vase. The simple white arrangement appears more serene when placed in the blue jar while the colorful arrangements become more playful with the added dash of blue. 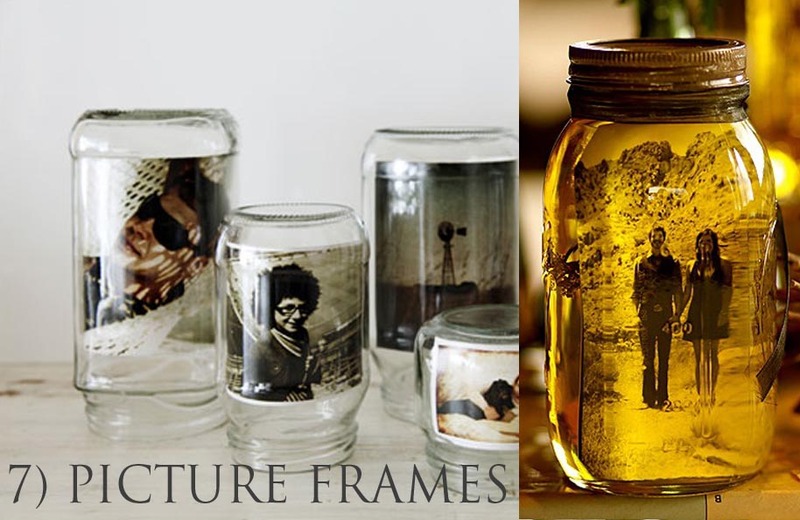 What’s a more creative way to protect and display your pictures than in the safety of a glass jar? You can even add food coloring to create a sepia tone look for your photos. Serve your guests food out of a mason jar too. These baked beans can be put into the jars ahead of time and warmed (in the jar) for the reception. It would be unique and keep your food station neat. And who knew you can actually bake mini pies and cakes in mason jars? How perfect! For favors you can decorate and fill mason jars with almost anything. Candy is an easy filler but you could also use other objects like crayons for kids, or golf balls for groomsmen. Guests will not only get the goodies inside but the jar itself, which as you have seen – can be quite useful!